Geass eyes were from Lelouch of Code Geass. I'm sorry, but... that's awful. Two bad animes combined in to one? Eeesh. But if you mean that both are bad in the sense that they're actually Evil or anything like that, suits the mood for me. Haruhi + Geass = Extremely wicked. WEE! haruhi looks good with the geass . I can't believe it took me so long to realize what it was referencing. Sweet! This is cool man! ...is what I said when I say this. hahaha... nice one.! 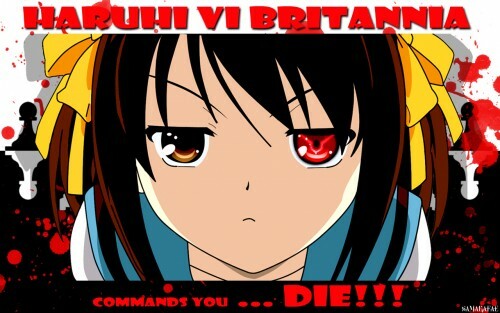 all hail haruhiism..
Nice Haruhi Vi Brittania wallpaper! Great idea, i think it fits perfectly on her specially commanding people. She's GOD and propably don't need Geass...but Lelouch and Haruhi? Haruhi and Geass? GREAT COMBINATION!